Have you ever heard of “perfect pitch”? Perfect pitch is the ability to hear and identify pitches accurately in an instant. This skill seems to come naturally to those who have begun their practice of musical instruments such as piano and strings at a very young age. However, students who have started practicing later in life tend to have a hard time learning this skill. If your kids are trying to learn music at a young age, then that’s perfect. They’ll get to develop their perfect pitch in no time. Other musicians cope by developing their relative pitch. But what is relative pitch? Relative pitch is the ability to distinguish between different notes along with the quality of varied musical elements like scale and chords. Anyone can train their relative pitch. You have relative pitch when you are able to listen to music and identify any difference. 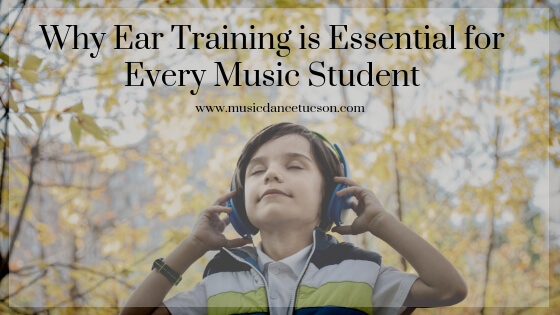 By studying and practicing ear training we improve our musical prowess. With ear training, we are able to fully understand the music we listen to and we produce. Learning new music can be faster by being able to recognize and anticipate all the elements. While it takes time and patience, training your relative pitch can be very rewarding. It opens doors for you and lets you explore all your musical abilities. At Music and Dance Academy Tucson, we have been offering music lessons since 1995. We bring together a community of highly distinguished international faculty who can offer personalized attention through private lessons, group classes and ensembles, as well as master classes and workshop. Discover and develop your musical gift with us. Contact us to arrange your first lesson today!